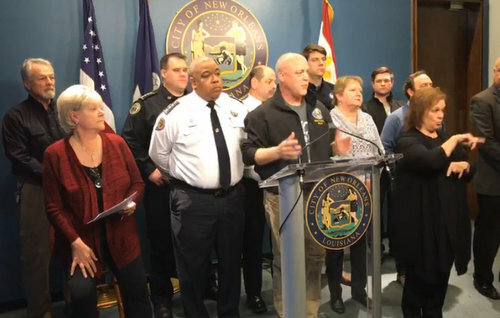 The water pressure in New Orleans rose enough overnight that officials are able to begin testing it for contamination, but residents should continue to boil water and drink bottled water until that testing process is complete, Mayor Mitch Landrieu said late Friday morning. The boil water notice became necessary during this week’s freeze after water pressure fell to the point that officials could no longer guarantee against contamination leaking into the system. On Thursday, officials asked residents to refrain from using any water where at all possible, to allow the water pressure to begin rising again. With warmer temperatures, residents no longer had to drip their faucets overnight to prevent the pipes from freezing, and owners of many properties with broken pipes were able either to shut off their water or get the leaks repaired — all of which reduced strain on the system. By Friday morning, system-wide pressure had risen to the point that officials could begin water-quality tests, Landrieu said, though they will take 24 hours to complete before the boil-water notice can be lifted. In the meantime, Landrieu said, water conservation remains a priority. In particular, Landrieu urged private property owners to double check for leaks that may have occurred as a result of freezing pipes. Even if the faucets turn on, Landrieu said, there may still be a leak somewhere on the property. City Councilwoman Susan Guidry urged residents to check on their neighbors’ properties as well, especially if they have been out of town and may not know they have leaks. The city is preparing a public-service announcement to teach residents how to turn off their water to their homes if they find a leak and can’t get it repaired immediately, officials said. All roads and bridges have reopened, and the airport is now open as well, officials said.